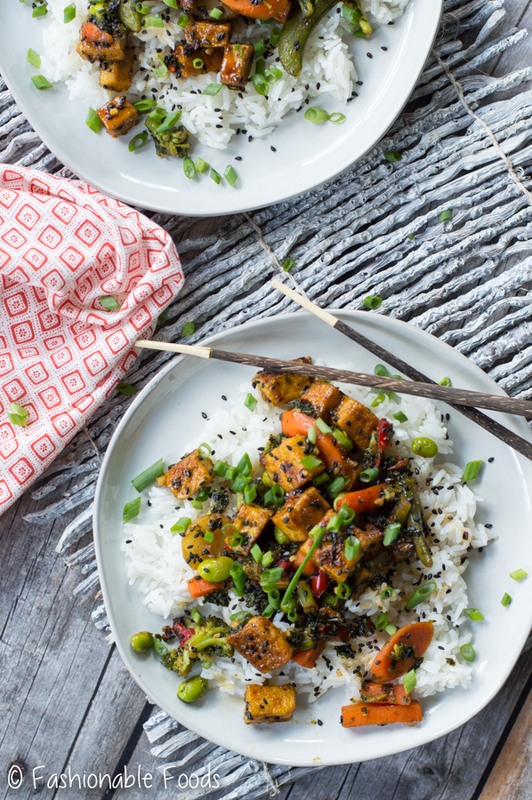 Sticky, sweet, and a little bit spicy describe this sesame honey tofu stir fry perfectly. It’s quick, simple, and can be made with any protein and veggie combo you like! 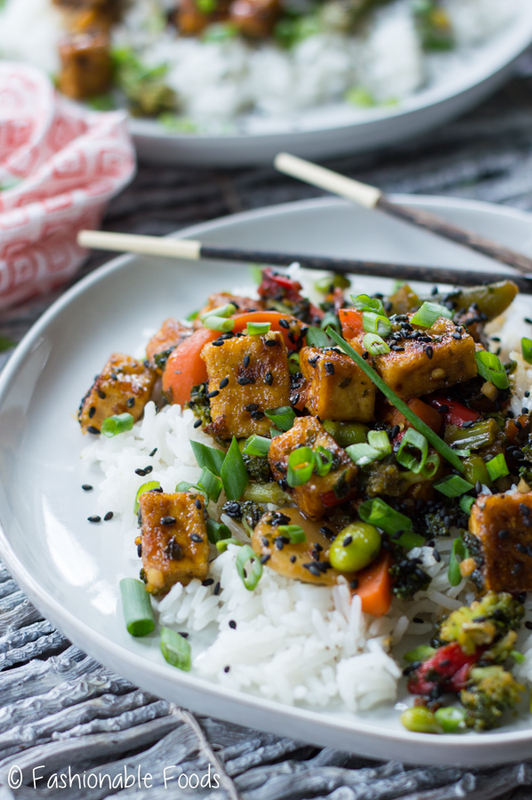 Sticky, sweet, and a little bit spicy crispy tofu tossed with frozen veggies and served over fluffy rice. Yessss. Oh, did you scoff at the mention of frozen veggies? I get it. I used to be that person that would never use frozen veggies because fresh is best! Right? When you’re pressed for time or it’s the middle of winter (like right now) frozen veggies are the best! 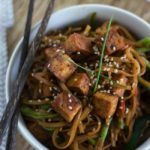 You can get stir-fry blends really easily in the freezer section of your grocery store, which makes this recipe perfect for a weeknight. Plus fresh vegetables can look a little sad this time of year so having a good frozen blend on hand is a must. And let’s be honest, the convenience is just really hard to beat. 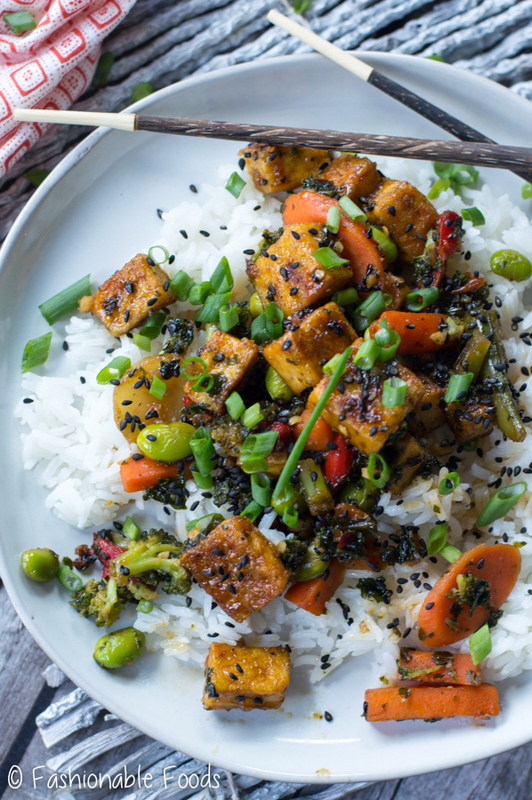 Now that we’ve gone over how great frozen vegetables are, let’s talk tofu. Are you repulsed by that one, too? 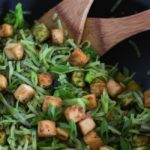 Tofu is one of those things you either love or hate, so if you hate it, it’s ok. Use your favorite protein instead! Shrimp, chicken, and pork would all be fab with this sesame honey sauce. 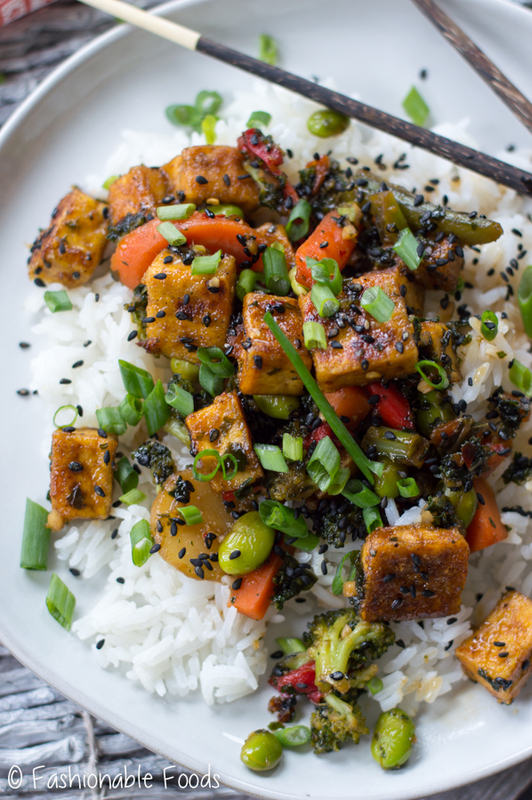 If you haven’t given tofu a chance, you should at least give it a try. You might be surprised. When tofu is crispy and tossed with sesame honey sauce, it’s a game changer. On its own, tofu is bland. But, when you pair it with a super flavorful sauce, it takes on all that yumminess. The trick to crispy tofu is using an extra-firm variety, getting a lot of the moisture out, and cornstarch. 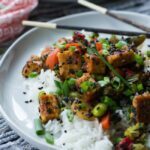 I like to remove the tofu from the package and cut into bite-sized cubes (not too small and not too big) and lay them out on a cutting board or baking sheet that’s been lined with a few layers of paper towels (or an absorbent clean kitchen towel). Cover with more paper towels, another baking sheet, and then weigh it down (I use my flour container). Let it sit for about 20 minutes before tossing it with a good amount of salt and pepper and a tablespoon of cornstarch. The cornstarch absorbs any excess moisture and gets us a nice crust on the tofu when we crisp it up in the pan! The sesame honey sauce is really simple. Just grab your ingredients and mix them together! 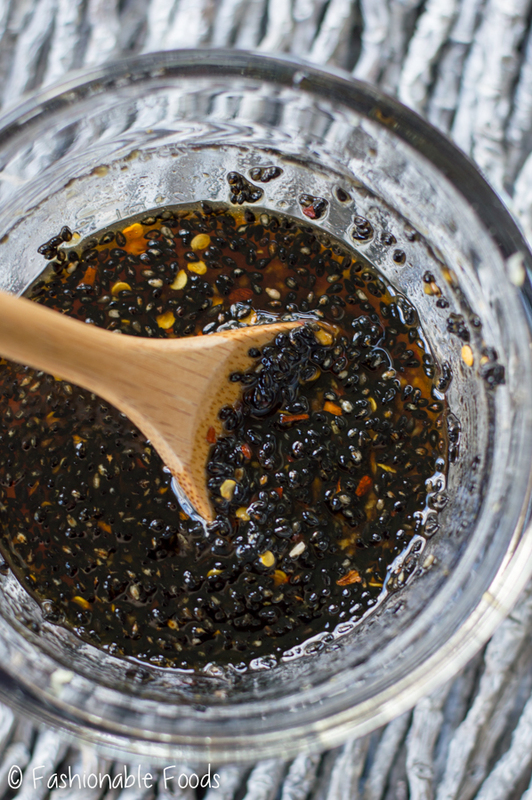 We’ve got honey, soy sauce, sesame oil, ginger, garlic, rice wine vinegar, chili flakes, and black sesame seeds. I’ve been obsessed with black sesame seeds lately. They have such a great texture for topping all sorts of Asian dishes. You can use regular white sesame seeds, too. Crisp up your tofu, toss with a few spoonfuls of the sesame honey sauce, and then transfer to a plate. Toss in your frozen veggies and cook ’em until tender and then toss everything together with the remaining sauce. It’s that easy! A quick note about the honey sesame sauce – you can make a few batches and freeze it! I’ve been working on some pretty epic freezer meal ideas and this is one of them. Talk about an easy meal – grab your frozen sauce and veggies and add a protein… bam you’ve got dinner! Stay tuned for a freezer meal post in the near-ish future. I’ve got quite a few coming at ya! 3 Cups Fresh or Frozen Mixed Vegetables, broccoli, carrots, peppers, snow peas, edamame, kale, etc. Whisk all of the sauce ingredients in a medium bowl and set aside. Toss the tofu cubes with cornstarch, salt and pepper. Heat a few drizzles of peanut oil over high heat (I like to use a cast iron skillet) and once it’s very hot add the tofu cubes. Leave them untouched until the edges are crispy and brown. Flip the cubes around and brown on all sides. 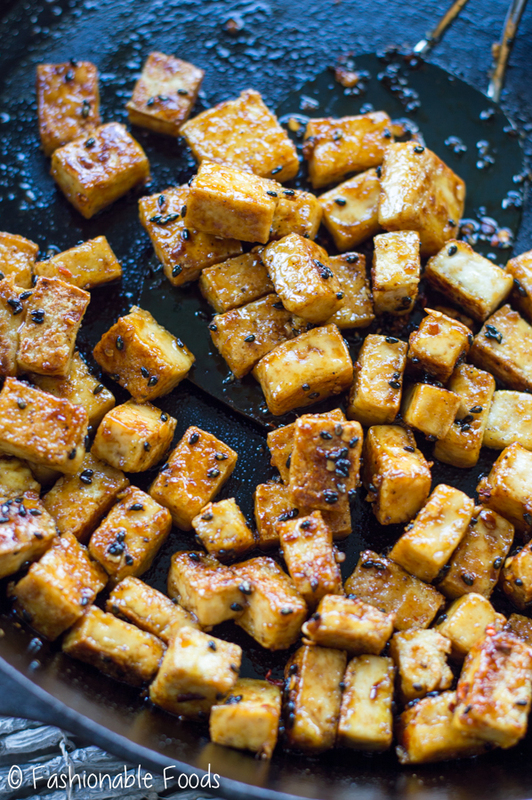 Once the tofu is browned and crispy, toss it with a few tablespoons of the sesame honey sauce and toss to coat. Transfer the tofu to a plate and set it aside. Add another drizzle of peanut oil and add your vegetables to the skillet. 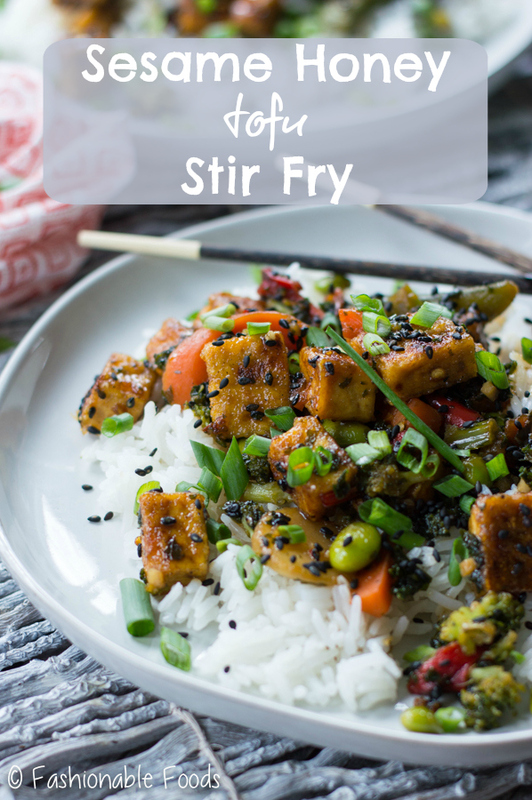 Stir fry until crisp tender, add the remaining sauce and the reserved tofu back to the skillet. Toss everything together and then serve over hot cooked rice topped with green onions and more sesame seeds. Enjoy! Came out wonderful!!! It was so quick and delish and looked as good as the photos. Thanks for sharing such a delicious recipe with us. It looks so good. 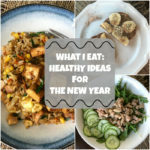 I love that it’s simple to make and healthy. I often have problems with tofu it it doesn’t come with some kind of sauce because there’s just no flavor. But, the Asian sesame seed sauce looks delish.